When we hit the road back in 2014, we knew staying online was a priority for us. It's how we run our businesses from the road, after all. And hey, Netflix is important, y'all. So we bought a Wilson Electronics Mobile 4G (often affectionately known in RVing circles as "the blue box"). 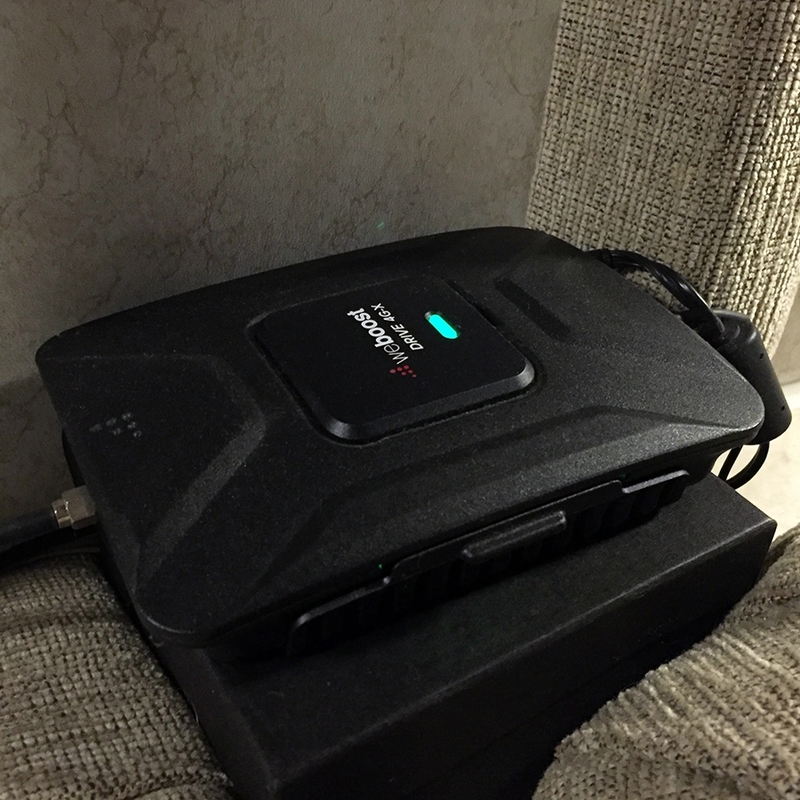 With our Mobile 4G cellular signal booster, we were able to take the strength of our signal up a notch (often from 2G to 3G, for example) -- especially helpful while boondocking in the middle of nowhere. We got our hands on a weBoost Drive 4G-X, Wilson Electronics' newest generation, and have been testing it all across Texas. The results are in, and... yeah, it's pretty sweet. Just using the inside and outside antennas that comes in the box, we're consistently able to boost our signal more dramatically than we had with the Mobile 4G. At this exact moment, we're sitting in Big Spring, Texas, where we were getting 1 bar of 4G on our Verizon Mifi. With the Drive 4G-X, we're up to 4 bars of 4G LTE with a download speed of 14.15 mbps and an upload speed of 9.41 mbps. The Drive 4G-X runs on 6V or 12A, suiting whatever your energy consumption needs are. It supports a variety of frequencies (LTE bands 2, 4, 5, 12, 13, 17 and 25) and has a max boosting gain of 50dB. It's suited for U.S. and Canadian cell frequencies, so you can take it across the border. Wilson Electronics makes the higher price point worthwhile through an extended signal range beyond any other booster we've tested, faster data downloads, and stronger mobile Internet signal. Their website boasts an easy installation, and we definitely found that to be the case. Right out of the box, we connected the booster to a power source, connected the outside antenna that comes with it and put it far enough away from the indoor antenna to make sure there wasn't any attenuation, and we were in business. Speaking of attenuation, we've had way fewer issues with this device than we did with the Mobile 4G, which can be a bit touchy regarding antenna placement. Plus the indoor antenna is great, so long as the Mifi or cell phone is literally right next to it. Wilson Electronics provided us with the Drive 4G-X to test, but that wasn't all. They also included two high-powered antennas, one for the inside and one for the outside. Both antennas are easy to install and are high quality. We used a suction cup mount to adhere the outdoor antenna to the side of the RV so we didn't have to connect it to the ladder. 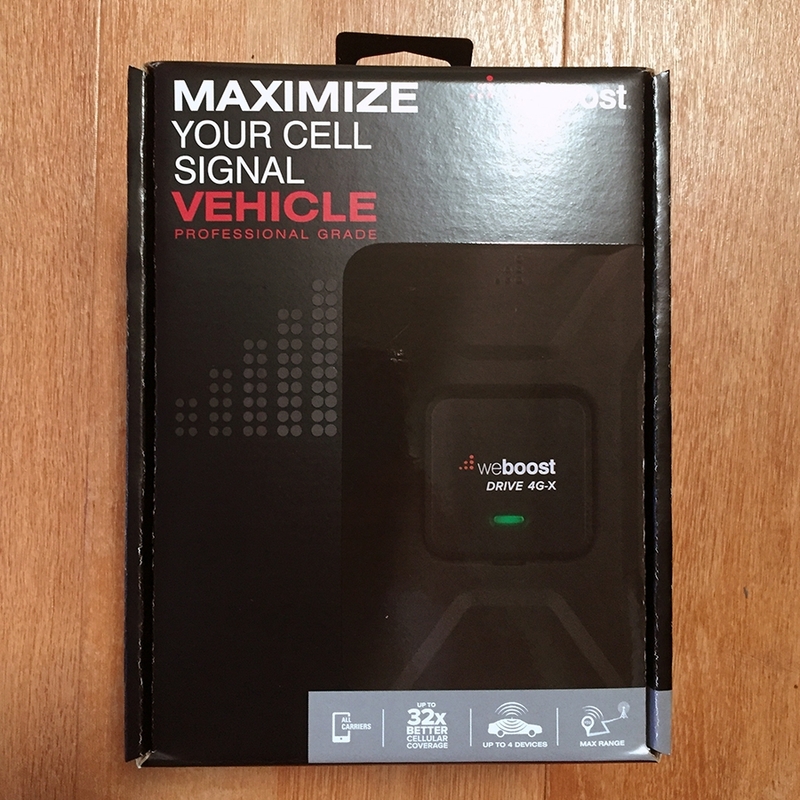 We're very impressed with the weBoost Drive 4G-X signal booster, which has become our go-to. So far (mostly in urban and suburban areas of Texas) the included outside antenna has been sufficient for our needs, but we're sure that as soon as we hit less-traveled areas, we'll be turning to the omni-directional and directional antennas more and more. 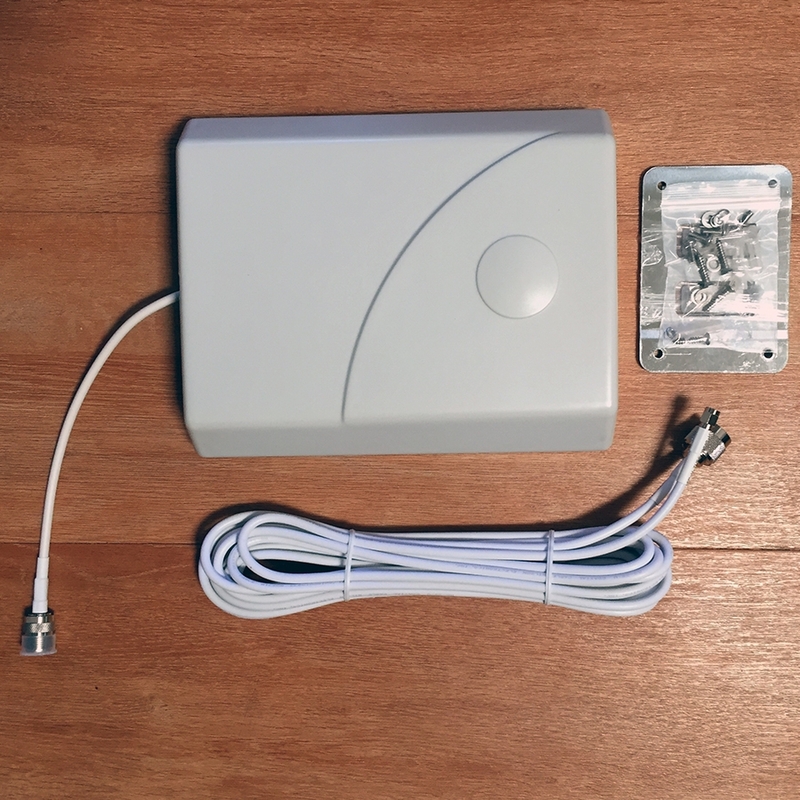 Note: weBoost has also just come out with the Drive 4G-X RV, a booster specific to RVs that comes with an optional indoor accessory kit, including a strong indoor antenna and an exterior antenna that mounts easily to an RV ladder. We haven't tested it, but we have heard great things from friends. Keep in mind, if you want to be able to take your booster with you in the car on day trips, the basic internal and external antennas that come with the Drive 4G-X reviewed on this page are far more portable. 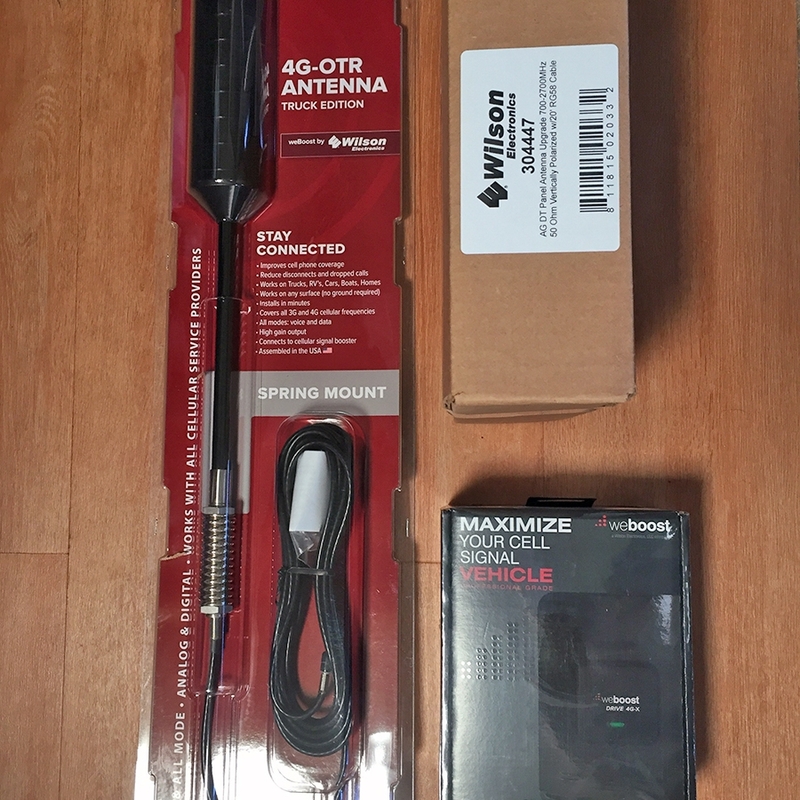 Disclosure of Material Connection: We received the weBoost Drive 4G-X, 4G-OTR Truck Edition Spring Mount Antenna, and Home & RV Indoor Antenna Upgrade Kit from Wilson Electronics to review, but our review is 100% our own. Y'all know we always treat you right. ;) In addition, the links in this article are part of the weBoost affiliate program (except the Amazon image links at the bottom). What's your experience with signal boosters and antennas? We'd love to hear about your equipment and how it's working out for you.